How Frequent are Your Late Payments? – Sometimes you may make your payment late due to your busy schedule. But if you do it frequently, it may hurt your credit score seriously. Don’t make the late payment as your habit; maintain your good credit behavior with your timely payment. How Recent are Your Late Payments? – The scoring model is designed to predict how you are going to pay your bills in the subsequent 24 months; your recent late payment records especially with the last 2 years weight a lot in your credit scoring. If you have a lot of late payment records in your past 2 years, it is predicted that you will likely to miss more payment in the next 2 years. As such, your score will suffer. How Severe are Your Late Payments? – The severity of your late payment also plays a big part in your credit scores. The 90 days late payment hurt your credit score more if compare to 14 days late payment. If you are too busy to make your payment on time, don’t late by too late because giving a great negative impact on your credit scores. 2. ” Settle” with your lenders on your debt Settling your debt with your creditors with less than the amount you owe them will create negative information called “deficiency balance” in your credit report. This may happen when you have unbearable debt, and you are getting a debt consolidation service to negotiate with your lenders to outcome an agreement to settle your debt with some reduced amount. You may be happy that you didn’t have to pay the full amount. However, the lender will report that remaining amount as “deficiency balance” to the credit bureaus as a negative item. A deficiency balance is considered just as negatively by credit scoring models as any other severe late payments. In your debt consolidation process, if you can arrange a deal with your lender so that they will NOT report the deficiency balance then that will be your best course of action; if not, your credit will suffer for 7 years. 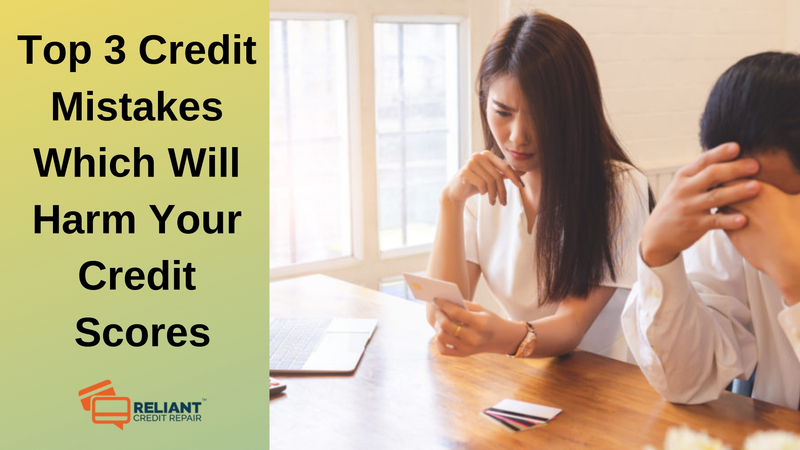 Your credit scores can be affected with your high balance on your credit card. .; Over utilization is the practice of running up balances too close to your credit card limits. For example, if you have a Visa card with a credit limit of $10,000 and a $5,000 balance you have a utilization percentage of 50% because you are using 50% of your credit limit. The higher the utilization percentage, the fewer points you will earn for your credit scores. If paying your cards off every month is unrealistic then try your best to keep that percentage as low as possible to maintain your good credit scores. Try to best to avoid the above credit mistakes to have a good credit score in your credit report.